What makes a travel agency successful? How they tailor their holiday packages? The balanced prices? Their self-promo strategy? Maybe all of these but in the end it comes down to bookings. You may have the most wonderful holiday offers at a fair price but if the booking process isn’t a hassle-free one, clients will “migrate” before you could do anything to change that. So let’s roll up our sleeves and see how to optimize the booking process by using an user friendly online booking form that converts visitors into tourists. 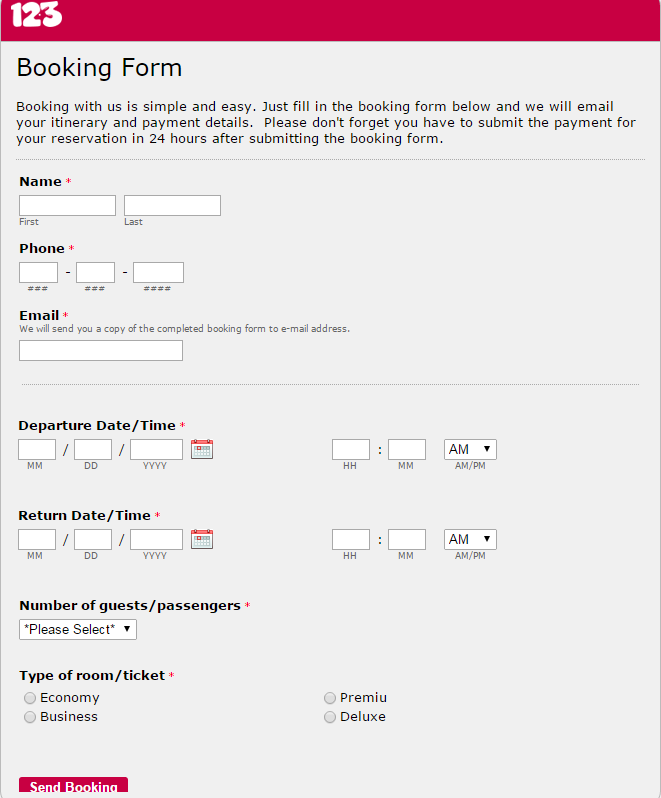 First thing, you should make your booking form match your site. Besides the fact that it suggests trust, a clean and good looking form also increases the fill out rate. Think of form branding as a business card for your company so customize it all the way – from logo, to colors and fonts. Secondly, strive to always keep your booking form to the point and relevant for your potential customers. You can apply this with field rules and show fields based on their answers. That way you’ll shape a personalized form filling process, keeping away irrelevant questions. In order to avoid unpleasant situations when the reservations outnumber the available seats or rooms or travel packages, you can always limit the total number of submissions a form can have. Also make your form ready to collect money. You can enable multiple payment processors just to make sure you give all the needed freedom to your clients. Finally, when all data is submitted and customer info is on its way to your database there’s one more thing you should do: craft a friendly confirmation message on the thank you page or set an autoresponder to reach their emails with your personalized content. Simple and effective, right? So, get going and equip your booking forms to convert visitors into tourists. Incidents can happen anytime. People can spot them in progress or there can be an emergency situation. People can call, but they can also fill out a police report form where they can describe what happened. A police report form is easy to create and to fill out, too. All you have to do is to select the type of crime, the place where it occurred and also the exact location or address where the incident took place. Such a form requires the name of the person reporting the incident and to describe the incident. The person who reports the incident has to certify that the report is based on true facts. Does it sound too complicated to build such a web form? Well, it’s not at all. With the appropriate online form builder it takes just a few minutes. And not only that it’s a walk in the park to create it, but also to customize it. From the user-friendly editor anyone, even someone without coding skills can drag and drop various types of fields, customize themes, set various notifications and security options in just minutes. It’s a breeze! The limit for submissions can also be easily set and the Thank you page can be customized. 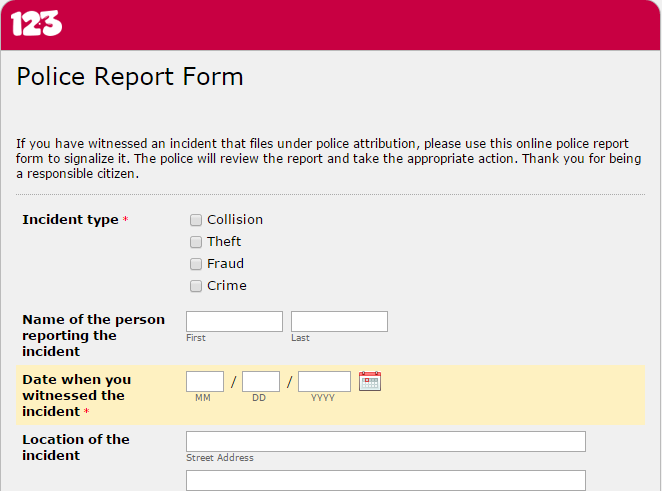 Anyone who wants to create a police report form can choose from a wide variety of templates. This type of form can be published on several platforms such as Facebook or Twitter pages, blogs and websites, so the audience reach increases. Data confidentiality should also be considered when building and publishing such forms. People are reluctant when it comes to providing some more personal details and thus, it’s more likely they won’t fill out a form even if they witness an incident. Under these circumstances, it’s recommended to mention and emphasize the idea that personal details will stay private. Irrespective of how anyone choose to create and customize it, the police report form allows anyone to be a responsible citizen. The police will receive what you filled in and start to take action. Conferences have been a growing trend over the past years for over a dozen industries. Not only do doctors or architects gather to present and discuss the latest developments in their respective fields, but so do marketers and members of nonprofit organizations. The best part about conferences is that they bring value to the community and to everyone involved in the event – speaker or attendee. Speakers have a chance to promote themselves and share their professional experience, helping others in their endeavours. Attendees have a chance to learn from some of the industry’s most famous people. The community has a lot to gain because attendees learn from the speakers and then grown their business, offering more jobs and through CSR. Starting organizing a conference is a challenge for anyone trying to do so, but regardless of what type of event you are organizing, you will need an online form builder to take care of probably the most important part of your conference – registrations. Use a standard conference registration form or simply build your own. With such a form you can find out everything you need to know about your attendees. From basic contact details to their occupation – student or company employee. This is important because you can discover your audience and see how your conference evolves in time. Apart from that, you can monitor the company’s evolution over the course of a year and see if they have evolved – thus being born opportunities for networking. Using such a form comes with a wide variety of advantages. First of all, submissions are organized into a table which can be easily viewed and segmented depending on your preference. Furthermore, you can set the limit for the number of submissions so you won’t sell more seats than the total capacity of the venue. The form is 100% customizable, therefore it can be embedded into your online platform and made to blend with the rest of your website and your brand. After a submission is made, the person can be redirected to a thank you page, either suggesting that he accesses another link or presenting him with a video from last year’s edition, making him more inclined to become a long time customer. All of this and more can be done with the conference registration form. Because this kind of form is the type that you would use at the beginning of a journey, but there are more to help you along the way. All of them are well worth a try! So, you’ve decided to organize a contest in order to activate a bit your audience. Good for you! Though you might think it’s a child’s play to set it going, there are some things you should consider first. In the end, you want the contest to bring you traffic and some relevant customer data. Here’s what to look at. It’s easy to digress from having a simple and easy to understand contest mechanism. You’d think that the more challenging it is to solve the puzzle and enter the contest, the better. Not quite. While people like to be involved, you have to make their way to the prize simple and fun. Try to leave aside the multiple steps mechanism – first like our Facebook page, then share, comment, then write an essay on the meaning of life… That’s overwhelming! Instead, think of an original idea to which your audience can easily resonate to and share along. While organizing your contest you don’t want to miss out gathering customer data. Make sure of that by setting up a contest entry form. It’s easy to set it going. You can use a template or customize it to your needs without any coding. The 123ContactForm user-friendly editor makes it all a child’s play by simply dragging and dropping the needed fields into your contest form, in real-time. In order to keep posted on form submissions you can easily set up custom email notifications. Ok, after you shaped the contest mechanism and made it easy for your audience to participate, now it’s time to promote it. Share it on social, on your blog, on contest directories. Consider using Facebook Ads to expand your reach. Make sure to use catchy and short invitations to enter the contest. All things considered, organizing a contest for your company it’s always beneficial – as long as it has the right timing, a relevant and catchy concept, easy registration and proper promotion. Everyone has an image of their dream house in their head. Some people are lucky enough to be born with a silver spoon in their mouth, some are not. But that doesn’t mean they can’t get their house, because you can make their dream come true with a loan. 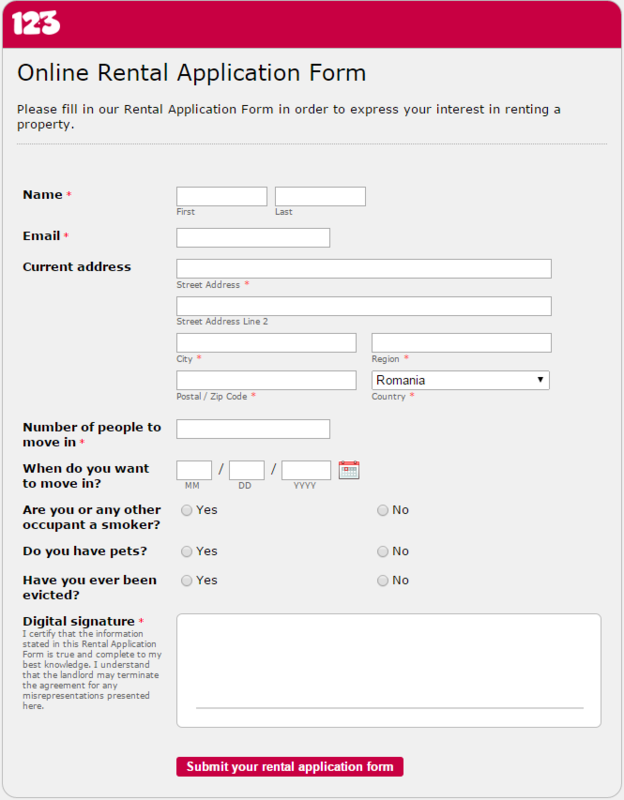 And for that, there is the online mortgage application form. This is one of the more complex forms because of the volume of information that needs to be inputted into an online mortgage application form. When you’re dealing with such a situation it’s always tricky to convince your clients to fill them out. But don’t worry, we have all the tools to carry you to the finish line. 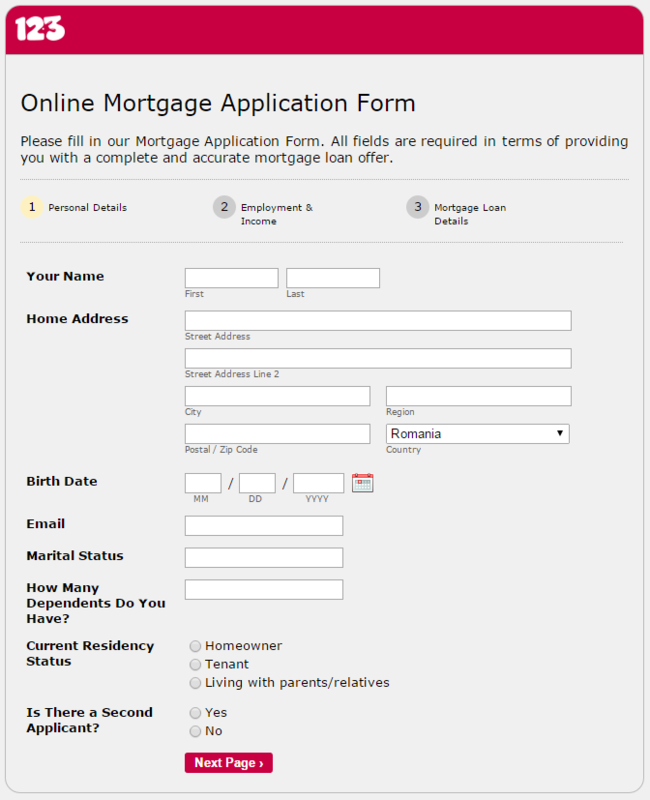 First off, this web form builder lets you customize every detail of your online mortgage application form. From length, to colours and even what notifications are triggered at form submission. Given the large number of fields this form has, we suggest you divide it into multiple pages with a page break. Doing this will give clients the impression that less information is required of them and it seems to take less time to fill it out. If your company gives out loans, especially through an online mortgage application, it must be a solid brand. And there is a solution for that too, in the form of the white label. With the white label plan you can fully brand your 123ContactForm account. Besides this, you can create your own form building service for your customers. Benefits include: using your own domain name (domain aliasing), favicon URL, extra publishing options and several other options. When cleverly designed, an online mortgage application form will seem short, to the point and will offer the applicant all the information he needs to be reassured information went through. A workshop evaluation form is the starting point for organizing professional and engaging events for participants. At the first glance, this form seems less important, but is actually a huge step for improving your next workshops. There are many aspects that make a workshop successful or less successful such as if participants learned something new, sharpened a particular skill, if the facilitator demonstrated comprehensive knowledge of the subject matter and more. If it seems too difficult to evaluate all these aspects, a workshop evaluation form will definitely help. The form can be created from scratch or you can use a template that can be customized as you want it. You can use radio buttons, Likert scales, text areas, checkboxes, use a background image and many others, depending on what you need. For example, by including Likert scales into your workshop evaluation form, you can discover how the participants in the event perceived several aspects of it. Likert scales can measure various degrees of importance, satisfaction, disappointment or quality. Asking participants if they would recommend the workshop to others is also an extremely important detail. 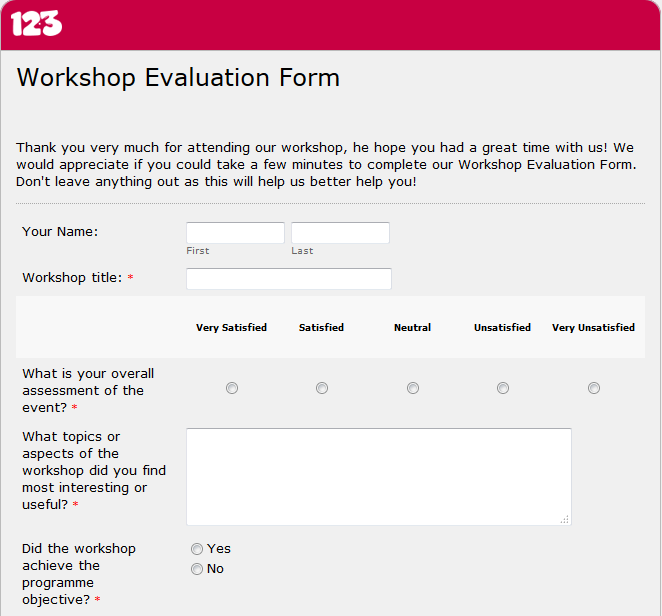 A workshop evaluation form is an easy to create, customize and use tool that lets you know more about those who attend the events you organize. From now on, you won’t have to ask yourself on and on what went wrong. Additionally, such an online form can reach a wide audience as it can be embedded on blogs, Facebook, Twitter and of course, Wix websites. To make it effective, think very well about the purpose and then about what questions you will include. Keep in mind to remain precise and clear about what you want to find out and how you will use that information. How the form will be designed is also important, aside from questions. Ask yourself how long it will be or if you have a designer that can make the form more eye pleasing. Is the workshop evaluation form too long? Do you need to use page breaks? And, very important: how will you use the results after? Feedback is critical for adapting workshops to participants’ needs and requirements. Many companies are sometimes anxious about how people react to their efforts. Work evaluation forms provide immediate feedback and shows business partners and participants that those who organized the event are willing to value their input and thus, improve similar events that will take place in the future. Have you used a workshop evaluation form until now? Was it helpful? Share with us your thoughts, we’d love to know more! Exit interviews are seen as a good practice within a company, a practice that contributes to effective people management. You can use them to tackle different aspects of your overall management strategies – including employees training. Asking the right questions can give you insights into what further training needs should be perfected or added. Make sure to shape your questions neutral so that you won’t influence your respondent’s answers. Sometimes an exit interview offers the chance to find out the specific reasons why some valuable employees are inclined to leave and change that situation. Maybe they need more opportunities to express themselves or want better chances to grow and develop. An exit interview form can help them get across that and hand you their motivation hook. Nowadays, the corporate climate can turn into a real argument why some people choose your company or want to leave it. With so many employees aboard, it’s not easy to keep everything run smoothly. But with constant feedback things can only head on the right path. Once one of your employees decides to leave, seize the moment and run him through an exit interview. Most likely he’ll bring to the table some aspects that need further improvement. When properly shaped, employee exit interviews make a handy tool for obtaining useful knowledge, insights and tips from the leaving employees, data that can be easily applied to better overall company practices. Finding a tenant is always tricky because as a landlord, demands are plenty. A landlord is looking for seriousness in a tenant, if he’s ever been evicted and whether or not a person is a smoker or if they have pets. All of these can be found out through an online rental application form. To find your perfect tenant, you can either use the provided template or you can customize it in order to tailor your brand. Change the font, add dropdown lists, radio buttons or colour it to your liking. You can even add your own brand to the form so it looks in-house built. All possible with white-label integration. Easy to create and embed on your website, publish it Facebook page and blog, this form is exactly what you need to find out what it is you want to know about applicants. All the information submitted through the rental form can be cleanly segmented based on your criteria and be viewed for an easier analysis. This is available through the Google Drive integration, which allows information to be sent directly into a spreadsheet. If you want to be alerted at all times if anyone submitted your form, you can add SMS notifications, delivering the announcement straight to your phone. Moreover, you can set up other types of notifications, all telling the user they’ve successfully submitted the form. If your property is in a more remote area or kind of hard to find, you can include an interactive Google map to make it easier for the applicants. This will have the address posted straight in the form so there’s no chance your potential future tenant will miss it. If you want to make a more compelling case as to the quality of your property, you can embed a video of the property in your online rental application form. This could have the effect of getting people more interested in it or make the material more shareable on social media. Otherwise, if video is not your style, you could always put pictures to showcase your property. All of these can be achieved with our web form builder. With a drag and drop ease, you can create your ideal online rental form as easy as 1-2-3. Demographics are essential for building a customer profile, especially in a changing market. They are statistical characteristics related to human population such as age, gender, income and are used by marketing departments to discover more about consumers and their needs. That’s why a consumer demographic survey is very important. It’s a very useful and easy to use tool for finding out the uniqueness of particular markets and consumers. In other words, a consumer demographic survey can tell a lot about how and why people buy. Such a survey reveals many details about the attitude that people from a certain area have about shopping and particular products or companies. What people believe about these aspects is can affect businesses on a short, but also on a long term. This survey is useful when someone starts a business in a new place and on a different market, but also throughout time, in different business stages to see how things have changed and how they can impact a company or a new product launch. The consumer demographic survey can be easily created with an online survey builder by starting from scratch or by using a template that is then customized. Due to this survey, marketers can create customer profiles and build their marketing campaigns based on respondents’ input. It’s the starting point for determining who a potential customer is and to locate the areas where most potential consumers live. Online consumer demographic surveys are excellent due to the fact that it’s very easy to collect and manage data from respondents. The results can be seen in the database on the Submissions section, receive submissions by email or check reports and charts in the Reports section. 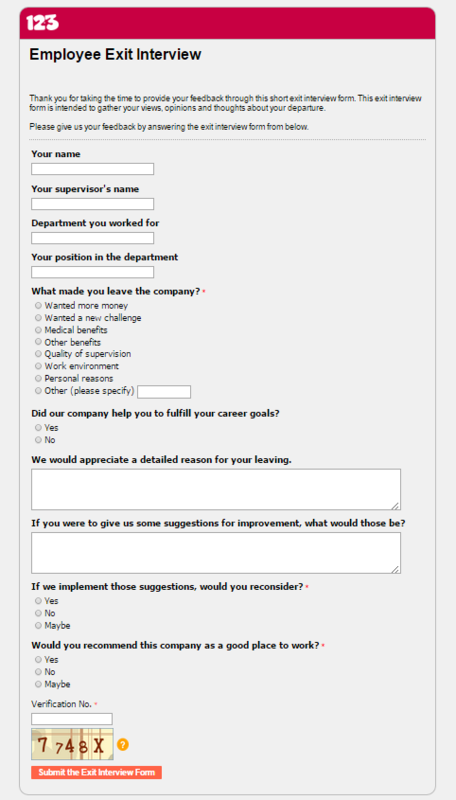 When building such a survey, dropwdown lists, Likert scales, radio buttons and text areas can be used to make filling it out a breeze. To reach a wider audience, you can integrate the survey into your social media pages (Facebook, Twitter), on blog and website. Online surveys created with 123ContactForm web form builder provide accurate insight on several aspects related to consumers that otherwise would be just subjective. If until now, companies were trying to sell their products and services through mass marketing, today they are doing target marketing. Thus, instead of trying to reach most people via media such as radio, TV and newspapers, they are getting only to those who are more likely to buy their products and services. 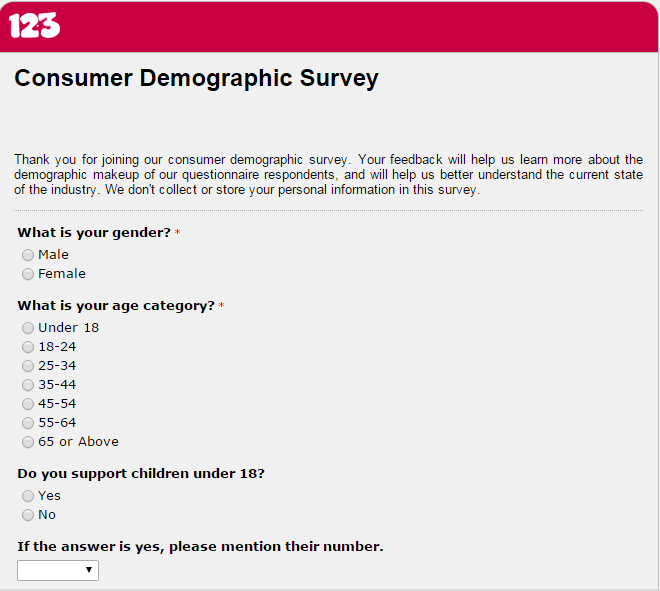 And of course, a consumer demographic survey is the ideal tool for this purpose. Applying such survey is extremely beneficial for many companies as lifestyles have changed a lot lately. Have you used a consumer demographic survey? Was it helpful? Drop us a line and tell us your experience! A cancellation survey should resemble as a visit to your doctor. Aside from finding a treatment for the current symptoms, you should also dig in the past and see what could have led to the present symptoms. Having your visitor’s answers on that can highlight areas that maybe you’ve been ignoring. On the other hand, you could also find out about things that you’re doing good in order to further enhance them. Even though you might think that everything is ok with your website and products, visitors could have a different opinion. They have specific needs and you are not a mind reader, so the best approach is to ask them just that – what was the main reason for canceling the service? The answers to this question will highlight possible issues for different stages on the acquisition process – product features, price, customer service, delivery options etc. Once you have your visitors in the filling out mode, take advantage of that and inquire them to share their ideas. Be it about product development or service improvement, any insight is valuable because it comes from direct experience – which means it’s objective and relevant for your business. Moreover, the simple asking for suggestions will build up your customer relationship by showing that you care and take into account their opinion. Before setting up your cancellation survey make sure you personalize it to fit your overall business image. Also consider making it mobile friendly since you want to ease the feedback gathering process and get the needed data on the go. With that at hand, go and take full advantage of your visitors input. And remember, any cancellation can be turned into a fresh lead with the proper follow-up. Good luck!